Hirst Avenue Rezoning Passed Unanimously. | MacDonald Gray Consultants • Land Use Planning, Landscape Architecture, Vancouver Island, B.C. 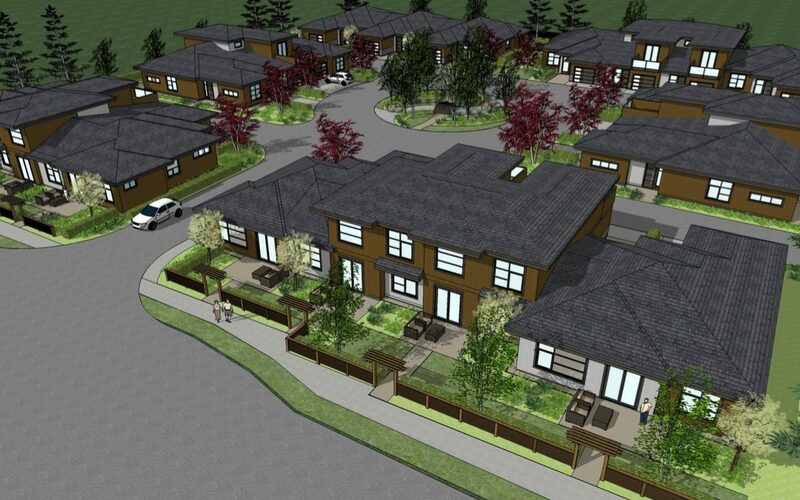 Residents citing a desire to preserve the single-family character of their neighbourhood voiced their objections to a proposed townhome development on Hirst Avenue West during a public hearing for a zoning amendment application in Parksville council chambers Wednesday, July 5. The application, brought by Nigel Gray of Macdonald Gray Consultants, would change the RS-1 (single family residential) zoning a 451, 461 and 465 Hirst Ave. to RS-2 (medium-density residential). The zoning change is requested to facilitate the building of a proposed 20-unit townhome complex on the 2.1-acre property that comprises the three adjacent lots. Nielsen was one of nine residents who live near the properties under consideration for rezoning who spoke on record, most of whom opposed or had questions about the project and its impact on the community. Dr. Kathryn Gemmell lives on Cedar Street, which terminates at Hirst Avenue West directly in front of the proposed development. She told councillors she and Nielsen went door-to-door soliciting opinion, and over the Canada Day long weekend visited 90 homes. Concerns cited by those who spoke publicly last Wednesday included increased density, traffic and noise in the neighbourhood, loss of enjoyment during construction, decreased property values and even the fear that it would set a precedent that would lead to “development creep” in the neighbourhood of single-family dwellings. The project first came before council on Dec. 5, 2016, when it was given first reading with a request to the applicant to supply the city with additional information and to hold an advertised public house.